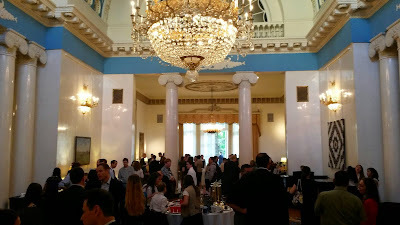 This evening Judy and I went to the "Town Hall" meeting for U.S. citizens in Russia, held at the ambassador's residence, Spaso House, in Moscow's Arbat neighborhood. The meeting was held on an off-the-record basis, so I'm not going to report on the substance of the evening. However, it's fair to say that we appreciated meeting the embassy's senior staff and having a chance to ask them questions, and we also enjoyed our glimpses of nearly 300 other U.S. citizens. This town hall is an annual event, but it was our first time in attendance. I hope to be back. Part of my interest, I confess, was simply to see this famous house, both its historical exterior and its legendary interior. It became legendary owing to Master and Margarita author Mikhail Bulgakov, who attended Ambassador Bullitt's Spring Festival ball held eighty years ago last month, and who transformed that ball into Satan's ball in his novel. The house has another connection specific to Elektrostal: it was built for, and was the last residence of, the acknowledged founder of our city, Nikolai Vtorov, Russia's first oligarch of the 20th century. It was Vtorov's industrial enterprises that were the foundation of modern Elektrostal. Spaso House is a five-minute walk from one of Moscow's best-known streets, the Arbat. For as long as I can remember it's been a pedestrian-only street, full of buskers, caricaturists, painters, and others seeking to earn a living from the constant stream of visitors. There are two Dunkin Donut outlets at last count, a McDonald's, a Starbucks, and even a new Shake Shack, along with many eateries with local roots. To add another reference to Mikhail Bulgakov, a small hotel named after him is hidden in one of the Arbat's courtyards. It's a great street to buy souvenirs if you like overpaying. But the main reason I like visiting this street is to see the monument to Bulat Okudzhava. I don't know how well Bulat Okudzhava is known among people of our students' generation, but for those of us who learned Russian during the later decades of the Soviet era -- and for Russians of that era -- his voice and his guitar became very familiar. Decades later, I still remember songs I first learned in Galina Stepanovna's classroom at Carleton University. 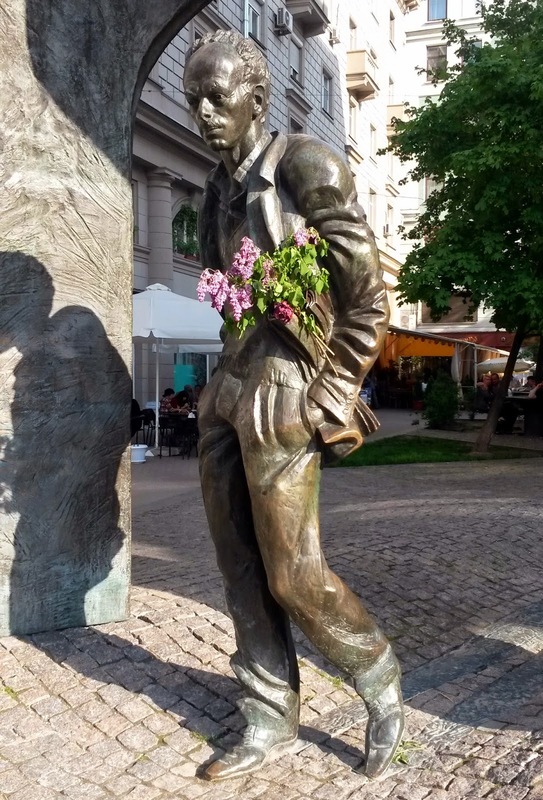 This evening, looking at his statue, I saw evidence that he's not entirely forgotten -- someone had evidently provided him with flowers. Better yet, one of the young guitarists performing on the street was proving very well that the folk-commentary genre of solo guitar music has not vanished from Moscow's streets. On the way into Moscow this evening, I read the last pages of a novel that has held me in a tight grip for several days. Apparently this novel, Atticus Lish's Preparation for the Next Life, has already been widely praised (example), so maybe for you this is old news: it's extraordinary. I have had a special place in my reader's heart for novels about immigration, being an immigrant myself. I also have a fascination with the experience of war and its effects on the soul. (I guess the phenomenon of organized evil is the real target of my curiosity.) This book combines these interests. This novel about the unlikely, fragile, feverish alliance of an Iraq War veteran and a young Uyghur immigrant woman (without ID or papers) reminded me at times of Joseph Conrad and Alan Paton, but really I've never heard a voice quite like Lish's. Aside from his amazing ability to peek into these dramatically different people's wrestlings with each other and with their own demons, his words bring the real city to life. I've never read another author who describes walking from one end of a huge city to another, as I often did in an earlier stage of my life when I was working something out in my mind -- or when I was trying to avoid working something out. Lish's New York is a character in itself, or a whole buzzing, brawling, chaotic family of characters. Special moments of insight linger: Skinner's roller-coaster emotions, amplified by drugs and alcohol, banging him around between dependence and resentment of Zou Lei. And her despair at getting him to take care of himself, even while she wonders why she has to do all the worrying for both of them. By the time the book ended, Skinner and Zou Lei's "next life" seems to be right here in my head. I find myself whispering to them, proposing other ways out. I try to interpret them to each other. I cannot put them away. Can anything good come from Nazareth? Come and see. A former U.S. ambassador and three other activists respond to the question, "what is it like to be hated online in Russia today?"